In Alxemy you add fauna and flora to a world by combining elements. You start out with just a few possible combinations, but as you find more elements the possible combinations increase. There is a list of elements you can create with your elements and a tutor who give you hints when you are stuck for a while. 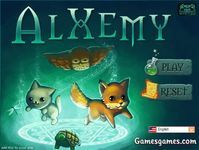 This game is based on an old DOS game "Alchemy". Another Alchemy's descendant is Doodle God.